"Blessed are the poor in spirit;" that is—the broken and humble in heart, who has no high thoughts or conceits of himself—but is lowly in his own eyes, like a young child. 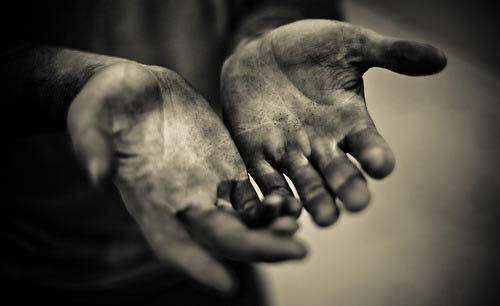 "Blessed are the poor in spirit;" that is—he who has no lofty or puffed up spirit. The poor in spirit are those who are lowly, being truly conscious of their own unworthiness. None are poor in spirit—but the humble. Lord to bring them into such a condition. as to their sure and only sanctuary! They see their need of God's free grace to pardon them. They see their need of Christ's righteousness to clothe them. They see their need of more heavenly wisdom to counsel them. They see their need of more . . .
of the patience of God—to bear with them, etc. They see their need of greater measures of faith —to conquer their fears. They see their need of greater measures of wisdom— to walk holily, harmlessly, blamelessly, and exemplary in the midst of temptations, snares, and dangers. They see their need of greater measures of patience —to bear their burdens without fretting or fainting. They see their need of greater measures of zeal and courage—to bear up bravely against all sorts of opposition, both from within and from without. They see their need of greater measures of love —to cleave to the Lamb, and to follow the Lamb wherever He goes. They see their need of living in a continual dependence upon God and Christ—for fresh influences, incomes, and supplies of grace, of comfort, of strength—by which they may be enabled . . .
tend to lead the heart away from God.